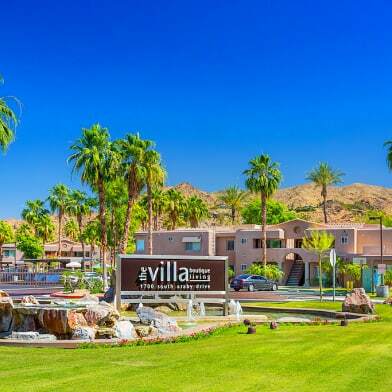 Lovely Palm Canyon Villas condo located on upper level with beautiful views of the mountains. Large bedroom with private bath updated and modern. Guest bath has been remodeled with designer tiles and fixtures. Grey washed wood look tile in the entry, dining and kitchen. Huge LR can be divided to accommodate a guest area or den area. Bright white kitchen with newer refig and range. Skylight brings in plenty a light and an airy feeling. Central AC Tastefully decorated thru-out. Furnished or unfurnished. Spacious balcony and dedicated laundry room. Covered parking space. Complex offers pools, spas, tennis. Walk to Trader Joe's. Such a great place to enjoy desert living. Have a question for 5285 E Waverly?